Remember that Alphabet Project I was making for my grandchildren? 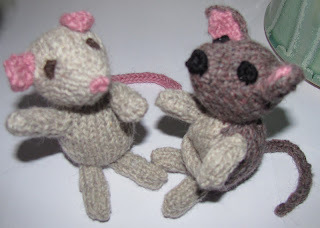 I gave them the first part last Christmas (posted about it here) - the middle part will be one of this year's Christmas pressies - from H to M. And it was those 2 letters that I hadn't yet made the toys for. H - what animals have names starting with H? 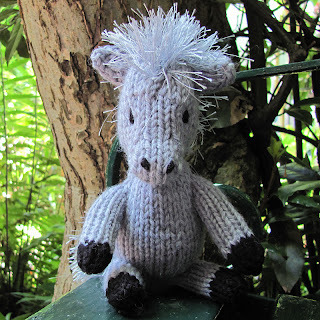 Hippopotamus is definitely not Australian so I settled on Horse. 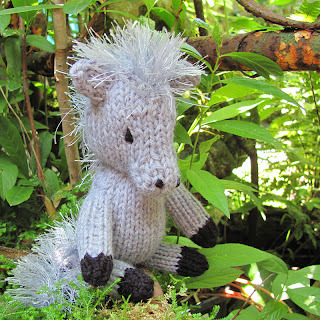 An easy pattern from Sarah Gasson's Knitables and very cute. Am not a fan of eye-lash yarn but it does make a good horse's mane and tail! The letter M simply had to be a Marsupial Mouse - remember The Muddle Headed Wombat by Ruth Park? 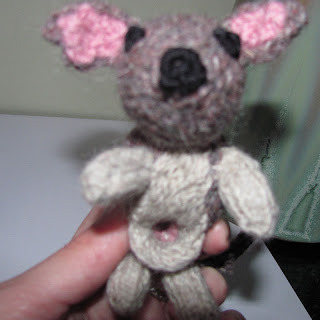 Wombat's friend Mouse was a Marsupial Mouse ... she had a pouch. Well, marsupial mice are not nice at all - they are carnivorous marsupials related to Tasmanian Devils - they just happen to be mouse sized; the Latin family name is Dasyuridae. We have the Antechinus and the Dunnarts - I tried to make a Dunnart because they look so cute - I think this is a White-Footed Dunnart. And here is a Wikipedia article on the Dunnarts. 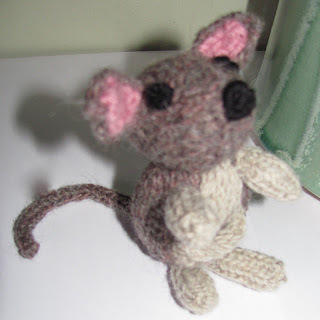 Used Marisol the Mouse pattern (link is to Ravelry) because Dunnarts have a pointy slightly up-turned nose - just like Marisol. Adapted the limbs by making them shorter & in the pale yarn, the tail is shortish and fur-colour, the ears are larger with pink linings, nose and eyes in black and quite large (Dunnarts are nocturnal). The pale mouse on the left is a Marisol Mouse unadapted … a regular Mus musculus. They seem to be friends.